It’s only a couple of days past the new moon and tonight the sky is clear here in Vancouver. Since young crescent moon sightings are favourable near the Vernal Equinox in the northern hemisphere I thought I’d keep an eye on the western sky as the sun set. 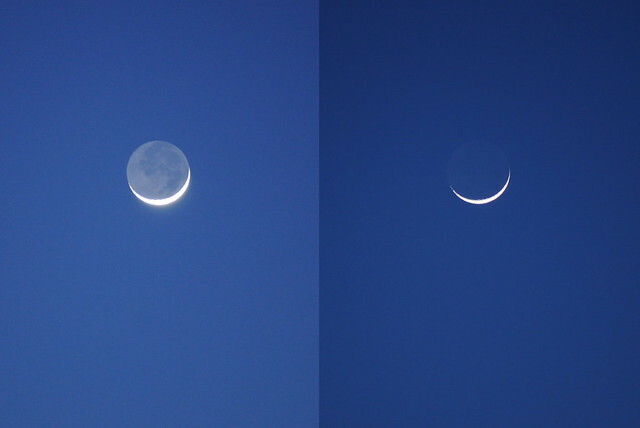 Sure enough, not too long after sunset I spied the most slender of crescent moons about 20 degrees above the horizon. I’m a sucker for photos of the moon so I couldn’t resist putting the camera on its tripod and wasting more space on the memory card.